Vintage Calder Security Alarm Book Discovered! It’s no surprise, given that the company was established in 1976, that we have a lot of history but this discovery was a real blast from the past. 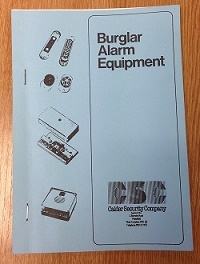 It’s the company’s Burglar Alarm Equipment booklet that has been sat in a customer’s drawer for over 30 years! He presented it to Sales Manager, Phil Lynskey, after a recent clear out (long overdue it would seem!). Phil may be the Sales Manager now but it was he who started the company 38 years ago and this brochure was all his handiwork from around 1982. Present MD, Simon Cook, was only 2 when this beauty was created and many of the staff were not even born then. 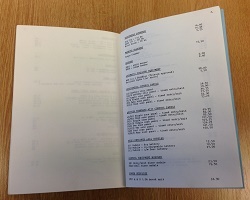 The booklet offered customers a guide to the different kinds of burglar alarm equipment available and a price list (interesting how advances in technology and mass production methods mean that some items are actually considerably cheaper now!). Each page was typed out manually and copied and the binding method of choice was a couple of staples. Despite the trend for vintage memorabilia, I don’t think we’ll be putting these back into production any time soon – we don’t know where we’d source the typewriter for a start!